Lap length is one of the important term in the reinforcement. This is usually confused with another important term called development length and anchorage length. In this article, the lap lengths of bars is discussed. During the placement of steel in Reinforced concrete structure, if the required length of single bar may fall short. To get the desired design length, lapping of two bars side by side is done. An alternative to this is to provide mechanical couplers. Lapping can be defined as the overlapping of two bars side by side to upto the design length. 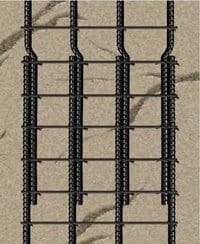 Usually, the stock length of steel bars is limited to 12m. This is for easy transportation of steel bars to the construction site. For example, imagine there is a need to build a 100ft tall column. But it’s not practically available. Hence the bars are cut every second story. Then the tension forces are required to be transferred from one bar to the other bar at the location of discontinuity of the bar. So the second bar is kept closely to the first bar and overlapping is done. This amount of overlapping between two bars is called “lap length”. Lapping is usually done where minimum bending stress is encountered. In general, lap length is 50d which means 50 times the bar diameter, if both bars are of same diameter. For flexural tension – Ld or 30d whichever is greater is considered. For direct tension – 2Ld or 30d whichever is greater is considered. The straight length of lapping of bars shall not be less than 15d or 20cm. The lap length is equal to the development length calculated in compression but not less than 24d. When the bars of different diameters are to be spliced, the lap length is calculated considering the smaller diameter bar. Lap splices should not be catered for the bars which are having diameter greater than 36 mm. In such cases, welding should be considered. But if welding is also not feasible in some conditions, then lapping may be allowed for the bars larger than 36 mm diameter. But along with lapping, additional spirals of 6 mm should be provided around the lapped bars. 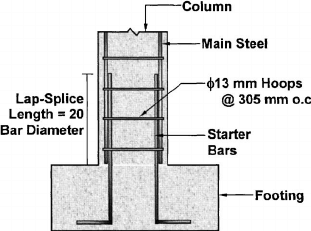 This infers that if we need to lap 20 mm diameter column bars, a minimum lap of 45 * 20 = 900 mm is provided.